Video engages Facebook audiences the most, followed by property listings and images and infographics. If a Facebook ad does well, keep investing in it and ride the wave. How many of Facebook’s 1.86 billion users could be a real estate agent’s next lead? The social media top dog is a well-recognized platform for real estate professionals to communicate with consumers, attract buyers and sellers and create their personal and business brand. The key is turning agents’ management of their Facebook advertising from a Wild West scene into a well-oiled machine — without losing that human touch. 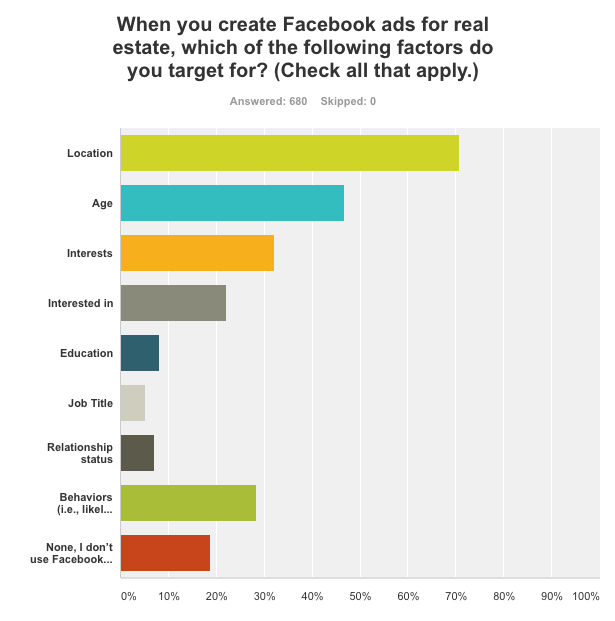 Amid concern from survey respondents that the Facebook real estate market has become saturated and industry ads are becoming “white noise” to consumers, those who are getting the most out of it are measuring and tracking what they do, posting consistently, investing more in ads that garner a good response and upping the ante. For real estate professionals who feel overwhelmed by all Facebook has to offer, they would do well to remember that the fundamentals remain the same. People like to read about and look at beautiful homes. A celebrity or personality element always draws them in. Consumers roaming the internet love an entertaining video or a good story that may only be peripherally related to real estate but tells them more about their community — or their Realtor. In our research, Coldwell Banker Bermuda Realty agent Lisa Douglas, who’s been in the business for two years, shared a major success story. She posted a Facebook video ad telling her market’s homeowners about her mad pre-approval skills. 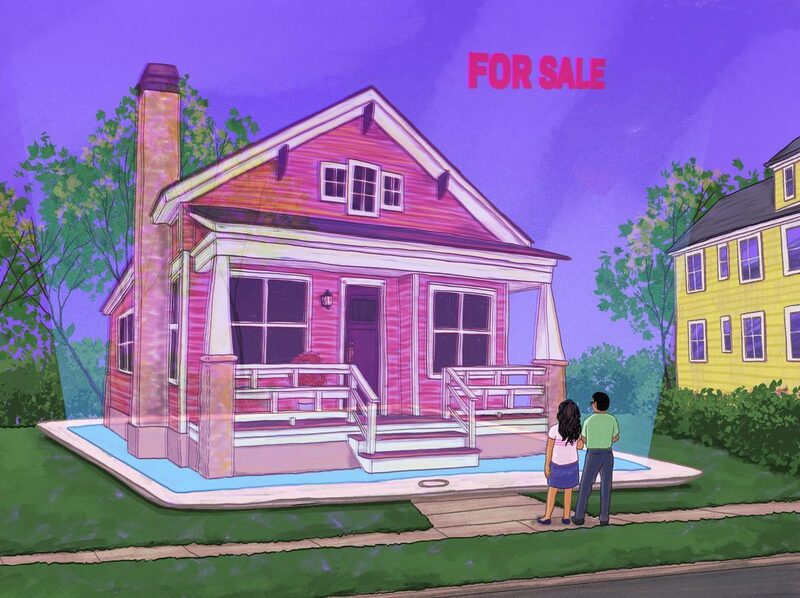 Through simple images with text overlaid, she told Facebook users that she had pre-qualified buyers for a variety of different homes, from fixer-uppers to chi chi waterfront apartments, giving ballpark figures of how much they were willing to pay. As a result she received 11 listings — she’s currently working on seven with four more to come. Now, agents have been doing this kind of thing for years by putting a similar pitch on postcards through neighborhood mailboxes, but Douglas did it in a creative way on Facebook, with pictures, maps and a lounge music track, and it did the trick nicely. The ad attracted 22,000 views, 53 reactions, five comments and those valuable 11 listings. It sounds so simple, doesn’t it? But Facebook lead generation is still hard to predict even for the more experienced, with many agents unsure of what will work, still at the stage of trying things out, and others having instant great luck and good successes. 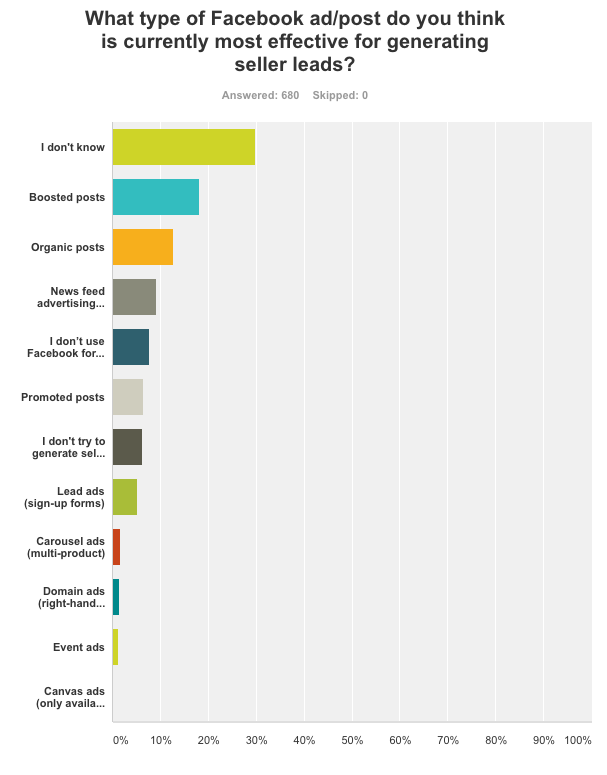 Our survey results pin down what’s working, the roadblocks in the way, stories of success and failure and an idea of what support agents need when it comes to Facebook lead generation. 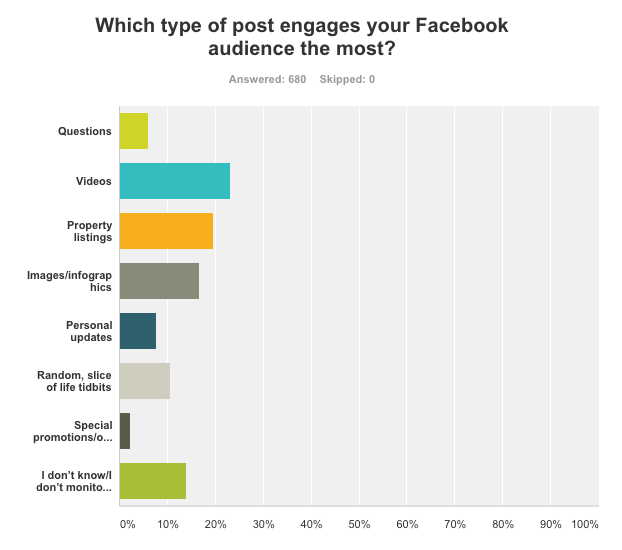 We asked some key questions: First, which type of post engages your Facebook audience the most? Respondents indicated video (23.09 percent), followed by property listings (19.71 percent), images and infographics (16.62 percent), then random slice of life tidbits (10.59 percent) as their top performers. Comedy, funny quotes or cartoons, and home valuations were also mentioned. “Videos get the most engagement; thoughtful image posts get the most reaction,”said a national coach/trainer. The survey also showed that Facebook leads, not unlike online leads in general, are slippery and snagging one doesn’t guarantee a deal. 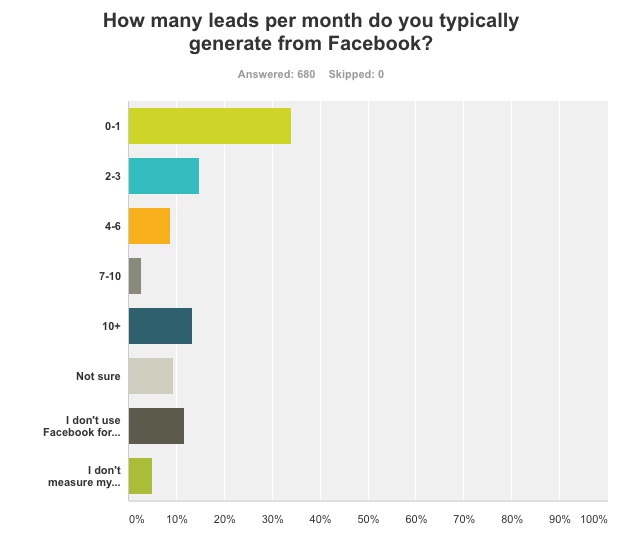 When asked how many leads per month they generated from Facebook, the biggest proportion, 34.12 percent, were only getting 0 to one; while 14.85 percent were getting two to three; 13.38 percent were getting 10-plus; and 8.68 percent were attracting four to six. Lead ads or sign up forms (5.88 percent). Nearly 30 percent of respondents weren’t sure which type of ad is most effective for generating buyer or seller leads, but those who did indicated that boosted posts reign supreme in both cases. The spend by agents on Facebook ads in real estate still seems very low when companies such as Curaytor, which specializes in helping people generate and convert leads on Facebook, is recommending agents spend around $500 a month if they are serious players. 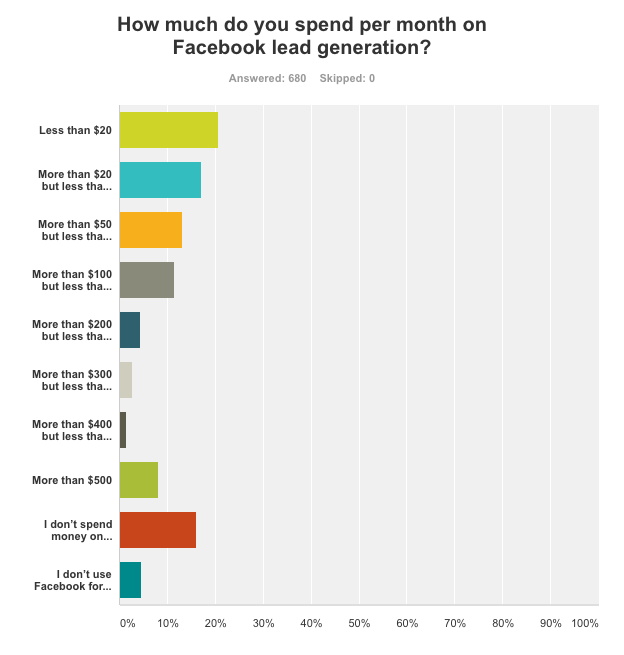 When asked about their spend, the largest group of survey respondents (20.74 percent) said they spent less than $20 monthly on Facebook; 17.21 percent spent more than $20 and less than $50; 13.24 percent invested more than $50 but less than $100; and 11.47 percent threw more than $100 at it but less than $200. 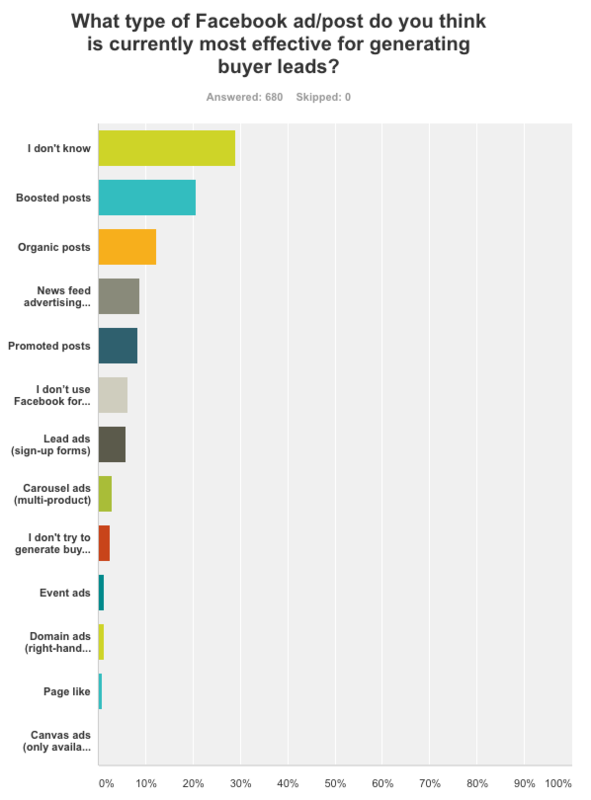 Of our group of respondents, just over 20 percent did not spend on Facebook for lead generation. “Everyone knows at least three Realtors, so it’s standing out, being different on social media that is difficult at times,” said one respondent. The quality of the leads can present a major problem, and related to that, weeding out the bad from the good. An established Boston broker, who spends over $200 a month on Facebook ads, noted that Facebook leads can be distracted and easily bounce from the platform back to Zillow and other consumer-facing sites. Meanwhile, consumers are growing cannier about handing over their information, and while they may view something, they may not respond to the post, added a California agent. Tracing activity from Facebook to a closed sale is not as easy as it looks, so agents might do best to consider it as a supplement to the heavy lifting, which happens through building relationships in person. But when asked to describe their own success stories or those they have witnessed online, agents demonstrated that they are, in many cases, gaining real value and business from Facebook leads. Virality and interest on the internet can be a tough nut to crack — what this variety of successful posts shows is that Facebook is no different. Targeting consumers on Facebook based on certain factors is a popular, and effective, lead generation tactic. The majority of survey respondents (over 70 percent) noted that when they create Facebook ads, they target for location, followed by age (46.76 percent). Don’t be shy about your expertise — flaunt it! People come to Facebook to connect with friends and browse baby photos, sure. But they also arrive seeking knowledge and insights on everything from what to cook for dinner to how to better organize their laundry. Why can’t you be the person who’s there for their questions about real estate? A New York-based agent from a large brokerage is connecting his YouTube videos (that demonstrate his areas expertise) with his Facebook efforts. “I boost a Facebook post usually once a week spending $75. This gets me in front of hundreds or thousands of locals and has gotten my YouTube page hundreds of views. I have received few leads, but leads nonetheless,” he said. Other success stories highlighting this opportunity feature a Lexington, Kentucky-based agent who boosted a post about a new grant program and snagged four leads out of it. A Colorado-based agent, meanwhile, is working on a lead generation ad for sellers — a free homeselling preparation guide, checklists included. “I will also try and get a survey question answered to determine exactly what their single biggest challenge is when it comes to selling their home,” she said. If she attracts enough responses, she will compose an industry report from it. 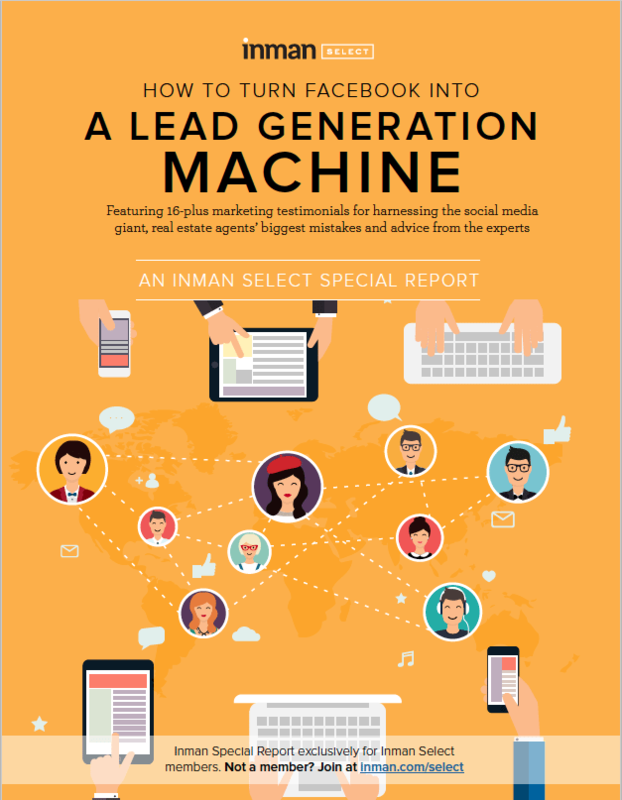 An experienced Maryland/Virginia agent on a successful team reported spending more than $500 a month on Facebook and goes about scooping leads in a very organized fashion. “I post four ads a day. Three reach the general market; one targeting the Latino market. All ads generate on average 90 leads per month. All ads include a link to a particular listing on my website. Not all those finding success on Facebook are paying for advertising. A productive St. Louis-based agent on a team said her approach involves 70 percent being active on her Facebook personal page and 30 percent on her business page. “I lead by example and demonstrate my expertise in my field, connecting with our clients,” she said. Starting a conversation with an interesting topic can be all it takes: “I will post a question about real estate and tag a dozen or so past clients who may have commentary to add. It results in a ton of comments, often sparks compliments on our path service and typically leads to a referral,” said an experienced St. Louis-based agent. And to no surprise, pictures of a pretty house are still rocking it on Facebook. “A listing ad for a higher-end property in the area with high-res professional images and great copy, [led] to hundreds of leads,” a successful Boston-based broker shared. In a market with low inventory, a just-listed ad can be eaten up, too. “I had over 100 likes, 45 plus comments and shares on a just-listed paid ad. The open house was packed both Saturday and Sunday. We received multiple offers the first weekend and the home sold over list,” a California agent said. Don’t forget: You are in sales and everyone loves a bargain: “A price reduction ad reached 35,392 people, got 11,161 post engagements for $164.71 or about $0.01 per post engagement,” said a happy team owner in Phoenix, Arizona. “I filmed a random three minute video for a new listing that I was about to put on MLS. The video posted Thursday evening and by my open house on that Saturday, it had been viewed over 7,000 times. Facebook Live, meanwhile, is being put to good use by some agents. How? “We are doing a weekly video update about our market. We use the Facebook Live feed because Facebook is pushing it and we give candid updates,” said a seasoned Alaska agent. Sometimes those high school friendships revived on Facebook can be well worth it. It came up trumps for this Malibu agent. “I got a Facebook message directly from a high school friend I haven’t seen in 12 years. Having a landing page that captures leads’ information is a must, many respondents urged. “Coming soon” campaigns that showcase images or a video of a property before it hits the market. If users want more, they have to provide their name, email and phone details. Virtual tours that showcase a home and entice consumers to check it out. If they want to tour the home further, they have to supply their contact information and consent to a Realtor reaching out to them. Creating an event that you can talk about on Facebook can also drum up real estate leads. One agent spoke of producing a home and garden show in Texas to spark interest and draw in new clients. What about mistakes? Where are real estate agents going wrong in this marketing sphere? 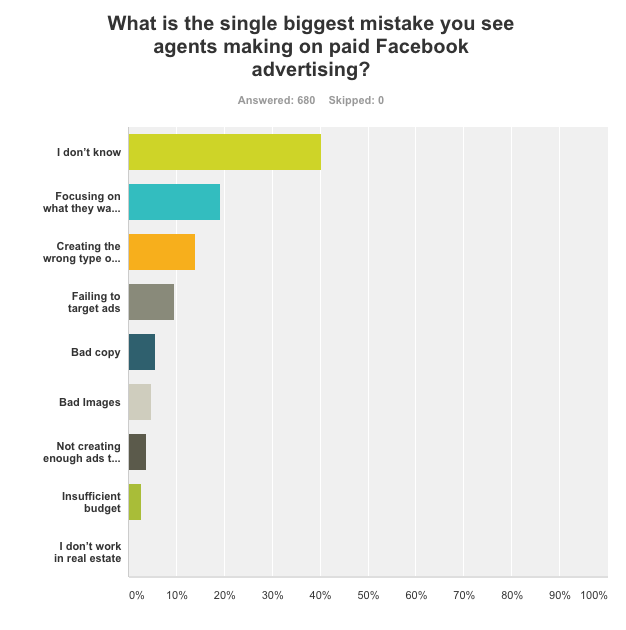 When it comes to paid advertising, close to 20 percent of respondents said agents’ biggest misstep is focusing on what they want rather than what the consumer wants. In addition, 13.97 percent pointed to creating the wrong type of ad; 9.71 percent to failing to target ads; and 5.59 percent to writing bad copy. This indicates that an agent struggling with engagement might consider prioritizing upping their posting frequency as they experiment with improvement. 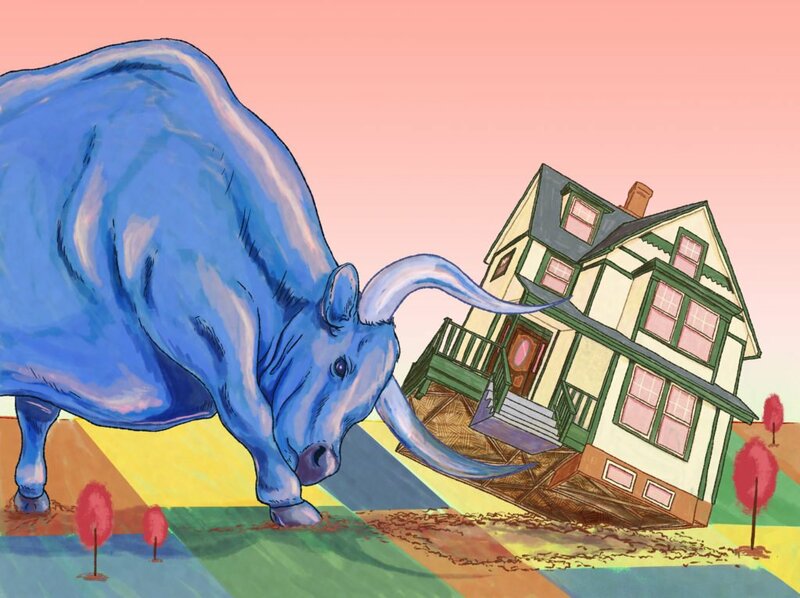 Too many home value ads competing against bigger brands such as the Zestimate and Redfin were a waste of time, added an experienced California agent. A number of respondents felt that Facebook was better for buyer leads than seller leads, though one can result in the other. People still rely on word-of-mouth in choosing an agent to sell, warned one respondent. Though an ad could generate interest in a listing or special offer, it alone isn’t likely to prompt consumers to choose you as their agent. A Pennsylvania agent was attracting seller leads with in-feed ads redirecting to a landing page, but Facebook’s algorithms continually change, and some strategies used to be more effective than they are now. What role do brokerages play? 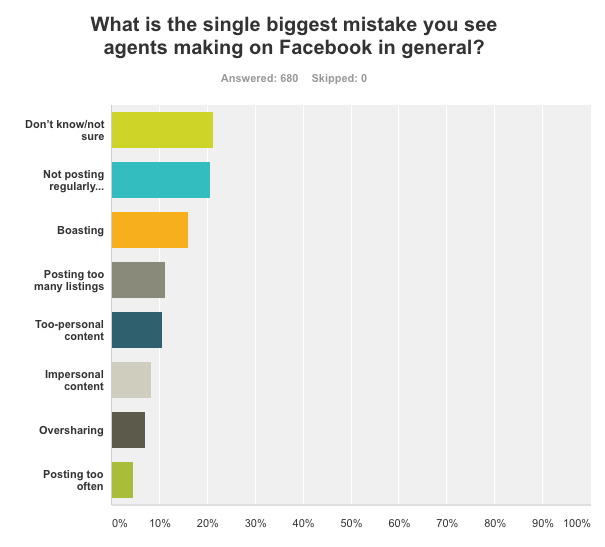 As agents work out how best to extract leads from their Facebook activity, more than half of respondents (54.85 percent) reported that they were not getting any support from their brokerage in this area. 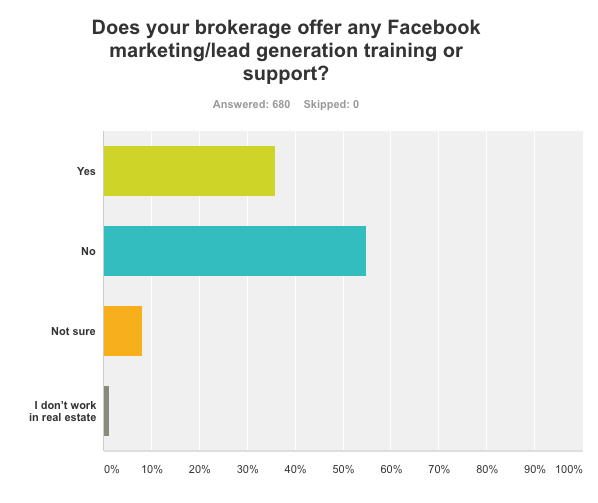 One possible reason brokerages are not offering Facebook training is that it’s hard to get right and brokers don’t know much about it themselves. And if they do provide something, there are complaints. “The training, though offered, is not very good. I could teach a better class. The issue is the teachers are not actually in the field using the product,” said a Florida team coordinator. An experienced Boston broker on a team has not found his Facebook training useful either. “They are too focused on ‘likes’ and not on using social media as a lead capture tool,” he said. “It’s at a basic level and my knowledge exceeds the random classes,” added another. The overall message that came through from survey respondents is that one-on-one training and anecdotal examples of success stories from brokerages would be more useful than general classes. Respondents recommending outsourcing, meanwhile, are in the minority at the moment. 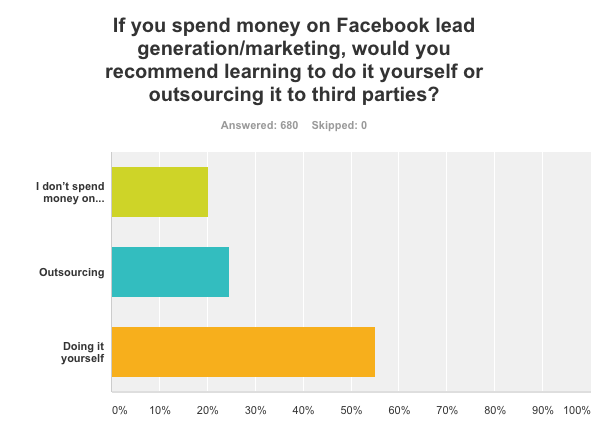 When asked if they recommended managing Facebook lead generation themselves or outsourcing when spending money on Facebook lead generation, more than 55 percent said to DIY while 24.5 percent said to outsource. This experienced Atlanta-based agent is delegating the role. “I have a full-time digital marketing specialist who posts five times a day on my listings as well as things that would be of interest to our clients,” she said. Sometimes a certain property calls for extra measures. A Rhode Island agent paid a third party to reach out across three states and to target one international, income-based demographic when marketing a $3 million luxury property. It was worth the effort. “One ad generated three showings in a week and one person drove up from New Jersey to Rhode Island,” she said. Chris Smith, co-founder of Curaytor, whose sole purpose is to help agents generate and convert leads through Facebook advertising, had some more tips for agents still in the wilderness on this form of marketing. First off, get your wallet out if you are serious about succeeding. To be a client at Curaytor, you have to be prepared to spend a minimum of $500 a month on Facebook advertising. In Smith’s experience, real estate professionals doing well on Facebook are doing well (in their business) already. “Our clients are looking to partner with the geeks,” he said. Smith understands why brokerages don’t do Facebook training — because it’s often something they don’t understand that well either — but he still believes they should be bringing people in to talk to agents and educate them about the medium. “Brokerages have a responsibility to do training to make sure that their agents are the best in the world,” he said. The Curaytor co-founder dismisses agent complaints about oversaturation on Facebook. He points out that a marketing method being popular is a sign that it’s an avenue for success. Smith warns that one of the biggest mistakes agents can make on Facebook is reducing their data down to a ridiculously small size — a ZIP code or a certain age, for instance. “When you reduce it so low, you end up not having a reach,” he said. He recommends a 50,000 to 100,000 catchment size. Facebook ads have a certain shelf life, he adds. Keep innovating. Meanwhile, from the brokerage viewpoint, Heather Flack, director of marketing at ERA Grizzard Real Estate in Florida, said that in addition to training, a brokerage can give agents content for their Facebook activity. ERA Grizzard writes two blog posts for each of its seven markets every month. Throughout the month, the brokerage also features city spotlight videos with accompanying blog posts. “We reach out to agents for their comments and tips they can add that showcase their experience, and these are read by thousands of people who can share the post,” Flack said. An agent might get 80 to 100 leads from such a blog post, she said. Flack, who does do Facebook training with agents as part of social media training, says she has agents Facebook Live streaming from new listings. The company with nine offices has opened a studio in one so people can come in and film themselves and practice their videos. Flack knows how popular video is on Facebook and tries to encourage all agents — even if they don’t want to be in front of the camera — to go out and film the community and do voiceovers. You don’t need to have a big, over-the-top personality, she tells them. Inman conducted the survey between March 15 and 22, 2017. There were 680 respondents, with 479 (70.44 percent) identifying themselves as agents, 166 (24.41 percent) identifying themselves as brokers, and 35 (5.15 percent) identifying themselves as coach/trainer.